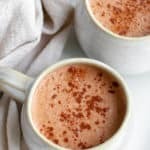 This healthy hot chocolate can be made in 5 minutes with only 4 ingredients. The perfect winter pick me up to warm your hands and belly! Healthy, Vegan & GF. Add all of the ingredients into a blender and blend until frothy. Taste and add more sweetness if desired. Pour the hot chocolate mixture into a small saucepan and heat over a medium heat until piping hot. Pour into a mug and enjoy! You can make this hot chocolate without a blender too - just use a whisk in the saucepan whilst heating the liquid to mix everything together/create a froth. If making for more than one, double/triple this recipe as you need. Vegan: Use maple syrup rather than honey, and a dairy free milk - I like oat milk for this recipe. If you can, try to use cacao powder as it is richer in nutrients than cocoa.